The Vice President of India Shri M. Hamid Ansari has said that the importance of faith and values in education has been emphasized in human society down the ages. Aristotle rightly said that “educating the mind without educating the heart is no education at all”. More recently, Gandhi ji stressed that literary education is of no value, if it is not able to build up a sound character. If the young friends in the audience follow these dicta, they will improve themselves and at the same time contribute to making this world a much better place for all to live in. 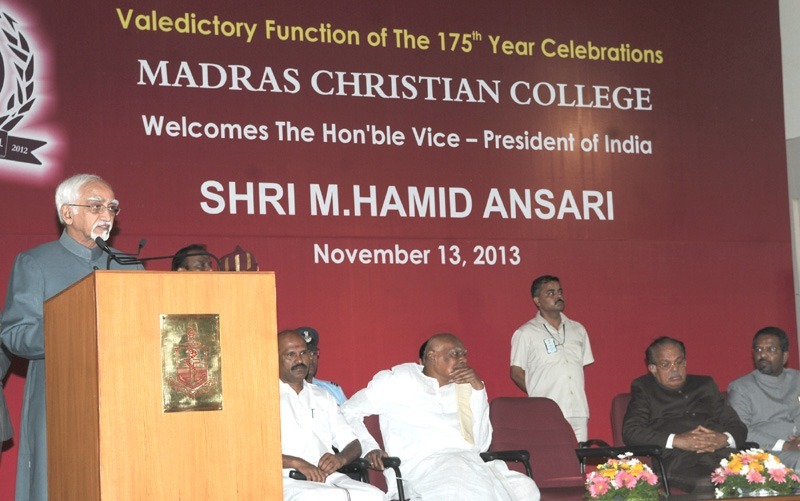 Addressing at the “Valedictory Function of the Quartoseptcentennial (175 years) of Madras Christian College (MCC)” in Chennai, Tamil Nadu today, he has said that the goal of education is not to produce machine-like humans. It is to inculcate in them a social conscience so that they build a fine balance between the heart and mind. True education should equip individuals to live creatively, responsibly, and peacefully and to become agents of change for a better society. He said that it is generally accepted that the human being is a moral creature, possessed of faculties that make it responsible for its actions. These faculties are intellect or a power of thinking, conscience or a capacity to distinguish between right and wrong, and will or an ability to make a choice on the basis of motive and character. Together, they constitute what has been called the moral landscape. Such a landscape does exist, consciously or unconsciously, in every human being and the effort of education, culture and civilization down the ages has been to awaken these faculties and hone them for individual or collective purposes in terms of the requirements of the period. The Vice President opined that in the twenty-first century, education is a critical tool for developing a modern economy, a just society and a vibrant polity. It provides skills and competencies for economic well-being and social mobility. Education strengthens democracy by imparting to citizens the tools needed to fully participate in the governance process. It also acts as an integrative force in society, imparting values that foster social cohesion and national identity. A well educated population, equipped with the relevant knowledge, attitudes and skills is essential for economic and social development in this century. It is estimated that developed economies and even China will face a shortage of about 40 million highly skilled workers by 2020, while, based on current projections of higher education, India is likely to see some surplus of graduates in 2020. Thus, India could capture a higher share of global knowledge-based economy work, if there is focus on higher education and its quality is globally bench-marked.